A warmer mix this weekend. The time we had two days in a row that cold in November was Nov. 23 and 24, 1938. Now we actually have close to seasonable weather. 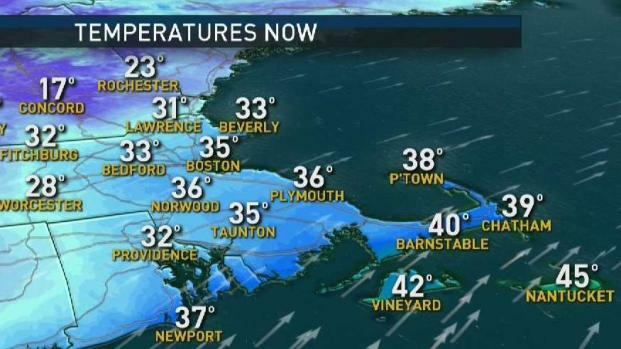 The average high temperature for Boston this time of year is 49°. We may get close to that today and Sunday. The strong cold high pressure system is moving south of us this morning, we start the day in the teens and 20s north, to 20s south. A few areas in Maine with snow on the ground cooled below zero once again. Several hours of sunshine this morning, followed by increasing clouds. A warm front in New York will bring rain into western New England after the sun goes down. Moving into eastern New England at midnight. Though the air may warm-up, the ground is still very cold so icy spots may be developing. 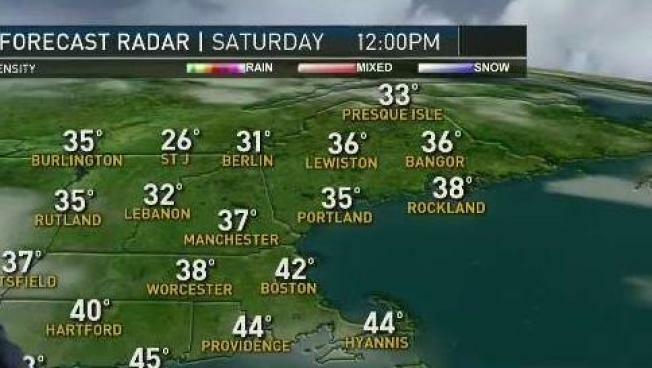 From the NBC10 Boston Weather Center… Today (Saturday): Mix of sun and clouds. Rain arrives at night. Highs in the 40s. Tonight: Heavy rain. Lows in the 30s to near 40. Sunday: Showers. Cloudy. Highs in the upper 40s. CAPE COD FORECAST Today (Saturday): Sunshine early, clouds increase during the afternoon. Highs in the upper 40s to near 50. Tonight: Heavy rain. Windy. Lows in the 40s. Sunday: Wind driven rain early. Highs near 50. Low pressure will be strengthening from Long Island to Nantucket early tomorrow, with rain heavy at times along the south coast at sunrise. We also have the possibility of damaging wind from the east gusting past 50 mph, with coastal flooding also possible. As we move north, weather improves to mostly dry near the Canadian border. For most of us the high temperature is in the 40s, if we get any sunny breaks in western New England we could reach the lower 50s, otherwise patchy fog and drizzle with an onshore flow may keep us in the low 40s. We tend to dry out a bit for the afternoon and overnight, but another batch of rain and wintry mix will arrive during the day Monday.